I’m fortunate to have a handful of friends that live gluten-free, making it a treat to go out to dinner with them and always a little more relaxing to dine in their homes. One of those special people in my life is Carter, also known as “Chili-T.” An academic, talented writer, and friend, I asked Carter to indulge my readers with the details of the experience she recently shared with her mom at Posana Café, an entirely GF restaurant in Asheville, North Carolina. Asheville is on the top of my list of places to visit, but I still haven’t made the trek. Well, I did go to Asheville once, when I was about 10 years old, but I only remember the fancy food elevator system at the Biltmore Mansion..
I’m not quite sure I’ve enjoyed a more delectable feast than the one my mama and I shared together at Posana Cafe during our recent weekend getaway to Asheville, North Carolina. On the morning before we made our trek to the beautiful mountainous region of Western North Carolina, Betsy gave me the scoop about this particular eatery in that it boasts a Gluten-Free Food Service Accreditation and has been awarded for its commitment to safe gluten-free food service. So, no sweat on the brow, no tremulous tummy aches, no nervous nail-biting worries at dinner. Because of the craziness of the concurrent Bel Chere festival taking place the same weekend of our “quiet escape” to North Carolina, we wisely made a Saturday night dinner reservation and had the choice of sitting outside or in. Although the patio was quite spacious and provided beautiful views of the sites and sounds of the folk milling about downtown Asheville’s historic Pack Square, we decided to forgo the heat and people-watching distractions and enjoy the lovely ambiance inside. Served by Cythera, our wonderful waitress, and an equally friendly serving staff, Mama and I were treated like queens during the entire meal. We explored their beautiful menu from start to finish and delighted in seeing the names of actual local farms from which their delicious fare comes. It was evident that we were in a restaurant dedicated to its community and equally dedicated to responsible, sustainable practices; even their literature that we picked up to review was made from recycled, post-consumer waste, chlorine-free paper. Cheers to going green (Atlanta, step up)! While their main entrees looked incredible (and reasonable! ), and we were quite tempted by such seafood selections of trout and scallops, we decided to get a wider expanse of tastes by ordering a sampling of items from their appetizer, salad, and small plate sections. Our first course consisted of two summer essentials: the soup of the day, a fresh gazpacho with cucumber-mint sorbet, and the Vietnamese spring rolls with shrimp, artfully wrapped and presented with gluten-free ponzu dipping sauce. Taking one bite at a time, we savored every morsel. Had we been in the company of our own home, I’m quite certain that mama and I would have each taken turns at licking clean our gazpacho bowl. Neither of us had ever tasted a soup so refreshing, and the dab of cucumber-mint sorbet in the middle was an unbelievable accompaniment that really brought it to life. We were still savoring our first course when our next series of goodies arrived, and as Cythera and company presented the plates of our marinated grilled vegetables, ricotta gnocchi, and local kale salad, our eyes were on stems. 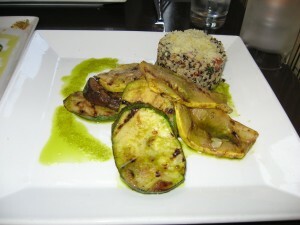 The vegetable plate consisted of thick, meaty slices of grilled eggplant, zucchini, and yellow squash, alongside warm quinoa salad with wilted spinach, tomatoes, parmesan, and all drizzled with basil oil. I had never before had gnocchi (potato dumplings), and our ricotta gnocchi was one of the most glorious things I have ever tasted. 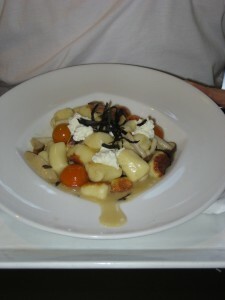 My mouth somersaulted with delight over this particular dish that offered heaps of gnocchi, sun gold tomatoes, wild mushrooms, and local goat cheese, all swimming together in the most delicious sauce. 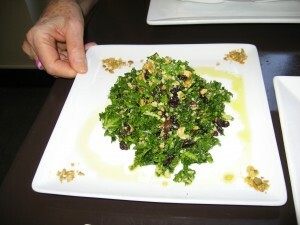 As if those two were not enough to satisfy and excite our palates, believe it or not, the local kale salad was our favorite. It arrived as a magnificent mound, freshly tossed with pumpkin seeds, currants, manchego cheese, lemon, and olive oil. It was seemingly so simple and yet so absolutely divine. While we did not want the evening, nor our grand feast to end, our parting gift came in the form of dessert. 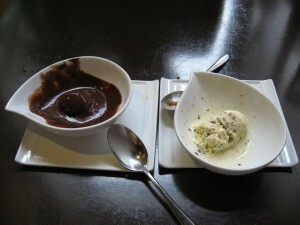 As die-hard ice-cream lovers, mama and I shared a serving of Belgian chocolate sorbet and mint chocolate ice cream, both made from scratch in the restaurant. We closed our eyes with every bite and could taste every single natural ingredient. This truly sent us over the moon and completed our heavenly evening at Posana Café. Even though we only experienced dinner, it is also open for breakfast and lunch, and I imagine that ANY food made in this glorious restaurant is nothing short of fantastic. Mama and I left feeling filled with good, REAL, natural food, and absolutely satisfied in mind, body, and spirit. Thank you, Posana Café, for an unforgettable experience; we WILL see you again…the sooner, the better. 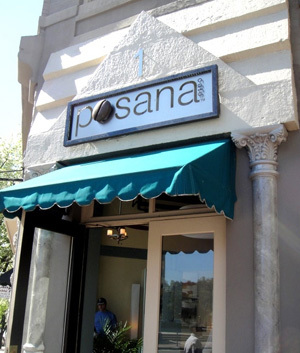 I love Posana! That is actually the restaurant where Jason and I had dinner just a couple hours after he proposed to me on a hike in Asheville! I remember having a delicious pork chop stuffed with apples and some delicious spinach and mashed potatoes on the side. 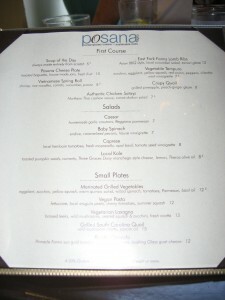 You must make the trip to Asheville and to Posana!